How well do Sheldon, Leonard, and the crew handle life outside the lab, in season 11 of The Big Bang Theory TV show on CBS? 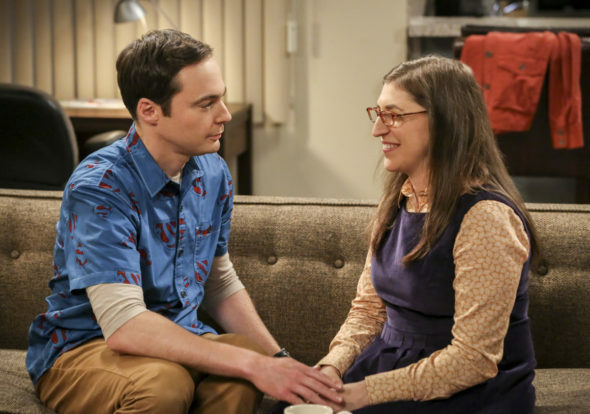 As we all know, the Nielsen ratings typically play a big role in determining whether a TV show like The Big Bang Theory is cancelled or renewed for a 12th season. Unfortunately, most of us do not live in Nielsen households. Because many viewers feel frustration when their viewing habits and opinions aren’t considered, we’d like to offer you the chance to rate all the season 11 episodes of The Big Bang Theory for us here. A CBS sitcom, The Big Bang Theory stars Johnny Galecki, Jim Parsons, Mayim Bialik, Simon Helberg, Melissa Rauch, Kunal Nayyar, and Kaley Cuoco. The sitcom revolves around a group of brilliant scientists who are still somewhat socially inept, despite their progress over the years. What do you think? Which season 11 episodes of The Big Bang Theory TV series do you rate as wonderful, terrible, or somewhere between? Are you happy CBS has renewed The Big Bang Theory for a season 12? Don’t forget to vote, and share your thoughts, below. Could never tire of this entertaining show. Love this show. I didn’t start watching until last year. I have been catching up on reruns. An adult webcam model from the Republic of Colombia loves this show and got me interested in seeing it. I am very glad she did. I no longer enjoy this show, the friendly banter amongst good friends has long since turned into cruel jokes, humiliation and bullying. I find most of the characters unlikable. unkind and mean spirited. Never never never kill this show! It’s hilarious lmao! I love it and so does my 78 year old mom. We’re 1000mi. apart, but this is one show we watch on mon or thur (depending on the time of the year), nights. It continues to surprise me with the hook ups, progressions is relationships, and babieSSSS!!! Dump this and also Superior donuts, 2 unfunny, stupid shows. This has been on 6 years too long. Dump it! CBS, we watch nothing on your network since you cancelled the girls!